Vegetables and Bedding Plants planted in the ground: established plants need at least one inch of water per week, more when bearing fruit. Check the soil around the plants, when it is dry one inch down, it’s time to water. Container Gardens and Hanging Baskets: check your containers every day for water. Either test the soil by touch or lift the pot to check its weight. Most baskets and many containers will need to be watered once, or even twice a day, depending on the weather. I suggest you fertilize once a week. 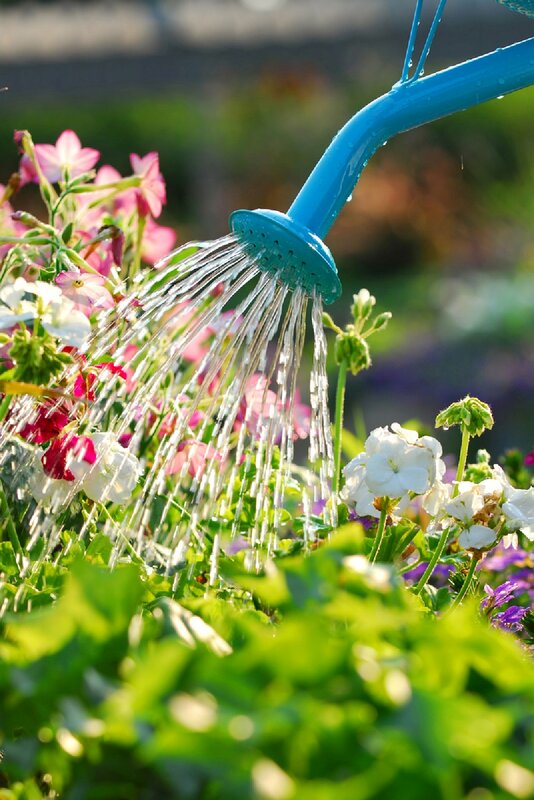 Perennials: newly planted perennials need daily watering until established, at least one to two weeks, depending on weather. After they show signs of new growth, apply a one inch per week rule. Trees and Shrubs: newly planted trees and shrubs should be watered every 4-5 days for the entire first year after planting, unless rainfall is abundant. Place the end of your hose next to the base of the plant and let the water trickle very slowly for about two hours. This will allow the root zone to become thoroughly saturated. 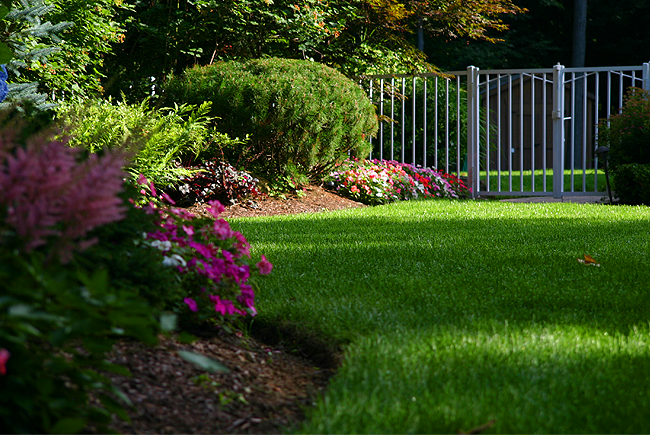 Established Lawns: your lawn should be watered when the grass blades don’t bounce back after being walked on. One inch of water per week should keep your lawn green and healthy. It is best to water early in the morning, before the heat of the day. This keeps evaporation to a minimum, and allows plenty of time for the grass to dry before nightfall, which will help prevent fungus problems. Newly Seeded or Sodded Lawns: for better germination, I suggest you mulch grass seed with straw as soon as it is planted. Once seed has germinated or sod has been laid, they must not be allowed to dry out. Water daily with a sprinkler until there is good growth. Early morning is again the best time. Once established, go back to the one inch per week rule. Water Gardens: also require an occasional addition of water. Check your pond weekly and add water as needed. Water plants have variable depth requirements, so you need to keep the water levels consistent.